Marc-Us Art, with birth name Margus Elts,was born on the 10th of November 1977 in Tallinn, Estonia. From an early age Marcus was fascinated by everything related to art, music and creative activities. 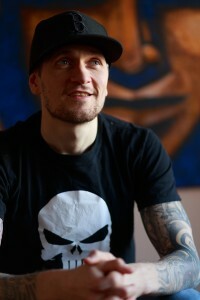 At he age of 11 he started singing as a soloist in death metal band (https://www.youtube.com/watch?v=pflI1SB8Vhw) and worked as an artist, DJ and music producer during the following years. DJ name Marcus was and is still familiar to many electronic music fans in Estonia: https://soundcloud.com/dj-marcus/dj-marcus-mix-salon-2009. At the top of his DJ career, Margus was diagnosed with an incurable disease and was abruptly forced to find other ways to express his creativity and artistic ambitions. Essentially, that was the start of his bittersweet journey towards painting. Without any formal art education, he started experimenting on his own, first with acrylic colours and small canvases, and then slowly progressed to oil paintings and larger works. So far his efforts over the last seven years have produced a variety of different takes on everyday life and his paintings now number around forty pieces. For him painting is both a passion and a way to earn livelyhood. Among his biggest influences, Margus mentions music, cinematography, childhood books and comics, the ever-growing pop-culture, tattoo art and of course everything related to the hip-hop culture – such as graffiti, posters, album covers etc. It is visible in his works – the slight exaggeration of depicted themes similarly to graffiti artists, comic-like colour choices and of course the touch of personal experiences with the painted objects/subjects. Cinematic works such as movies and music videos are a neverending source of inspiration to him as can be seen in the Gallery section. Other themes are often selected on the basis of what he perceives to be or have enough „emotion and character“ – that little something special that catches your eye and makes you smile.